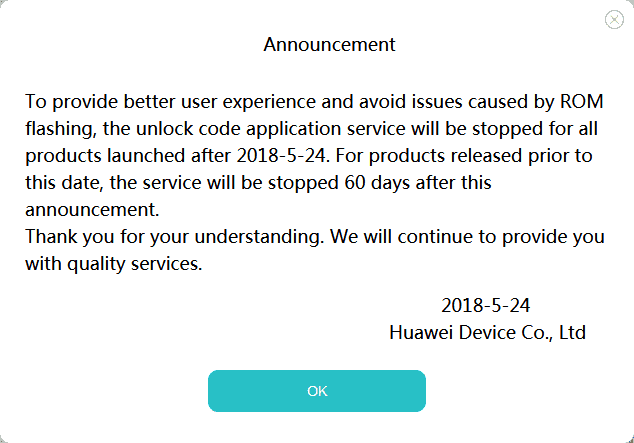 Meticulus Development: Huawei Ending Bootloader Unlocking. Yeah, it seems like this is a thing. Some of you might not be aware of this but Huawei/Honor has trouble in USA markets because of tensions between the U.S Government and China. Earlier this year AT&T dropped a huge deal with Huawei under pressure from the U.S. Government. You can read about that here. I do not know what effect this tension has done to Huawei/Honor's business. Perhaps this plays a role in their decision? Just a thought. Huawei/Honor seems like it can't make up it's mind. It starts and "Honor Open Source Program" which would seem to suggest a commitment to Open Source and then in direct contradiction chooses to end a service that would be required for this program to spread to other devices, guaranteeing that the program does not grow beyond this one device. It's like the old saying about the left hand not knowing what the right hand is doing.